When we first returned to South Australia I saw lots of La Casa del Formaggio cheeses in the supermarkets but it took me a very long time to figure out that it was actually a South Australian company. I may be the last person in South Australia to realise this but it is – and there is even a factory shop that you can visit in Glynde. I haven’t yet done this but it’s definitely on my to-do list. Because – cheese. So when I received an invitation to the book launch of the Casa del Formaggio cookbook I was disappointed not to be able to go, but happily I was sent a review copy! Review copies are an excellent way of getting around the supposed household ban on purchasing cookbooks and while we both love cheese, Andy can be a little bit hoo-hum when it comes to Italian food, so Italian cookbooks are especially good because they’re an excuse to cook Italian. The book is divided into primi, secondi and dolce and while I haven’t cooked any of the dessert recipes yet – they look amazing. Obviously there are recipes for tiramisu and cannoli but how good does rhubarb semifreddo amaretti sandwiches sound? Or four layer chocolate mascarpone cake? I ended up trying out the pizza recipe. We almost tried the potato, bocconcini and prosciutto cake – until I saw it contained 2kg of potatoes. Our family of three would have been eating it for a week! In fact, a lot of the recipes are geared for massive families. This makes them perfect for entertaining (or if you do indeed have a massive family) but if you have a small family be prepared to do some sums! In the interest of thoroughness, I even followed the pizza dough recipe. The main difference between this recipe and our usual one is that it includes olive oil along with the water. The resultant dough was very soft and a bit tricky to handle but made a great pizza base. Andy thought that the dough would be really well suited to making a thicker crust pizza – you can see from the photo how much crust we had. I liked it – and thought it looked fab – but the fact that the dough was harder to handle means I’ll probably revert to using my usual recipe next time (after all – I don’t need to look anything up!). 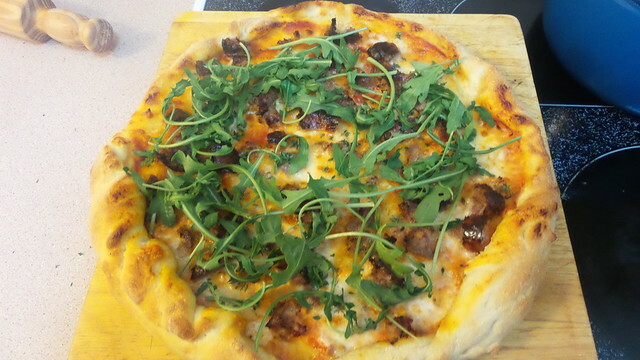 The topping was Italian sausage, bocconcini, thyme and rocket. Proper Italian pizzas are a GREAT reminder NOT to load up on toppings. Keep it simple. The real revelation here was using bocconcini in lieu of your standard big ball of mozzarella. It was soooooo creamy and delicious. OK – you don’t get those big long stretchy strings of cheese but the creamy flavour and texture was something else. From now on, our pizzas will be topped with torn bocconcini. Rather than tomato paste, the recipe calls for passata (we just happened to have some open). Although it’s a lot looser than tomato paste, I thought that because of the relatively simple topping it worked well. Tomato paste would have dominated the flavours and made everything taste too sweet. We both really enjoyed the pizza (and – more importantly for a cookbook review – it worked!) and it was lovely to make the bocconcini discovery. The is available from the factory shop for $15. Throughout June you might find your local independent supermarket offering it as a gift with purchase in-store promotion. Please water, yeast and a sprinkle of flour in a bowl (or the bowl of a stand mixer). Allow the yeast to activate and add the remainder of the flour, the salt and the olive oil and form a soft dough. Allow to prove until double in size. Preheat oven to 250C (fan) - or as hot as your oven will go. Knock back the dough, give it a light knead and then line a 30cm lightly oiled pizza tray. Spread the passata over the base and scatter over the crumbled sausage and the torn bocconcini. Scatter hot pizza with thyme leaves and then top with rocket.